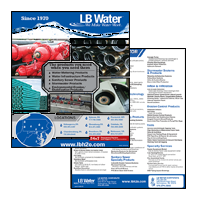 Whether you’re looking for water metering products, water infrastructure products, sanitary sewer products, stormwater products, or environmental-erosion/stabilization products, LB Water has you covered. After all, we’ve been making water work since 1970—and thanks to our expertise, and commitment to excellent service, we expect to do so for decades to come. Eight convenient LB Water locations provide you with immediate attention and products when and where you need them. Introducing Solutions for the Stormwater marketplace. Learn about LB Water by listening to our new audio message. LB Water is sponsoring, exhibiting, and/or presenting at the following upcoming events.